Husky 2 gallon Air Compressor it is a quality portable compressor equipped with dual-output provides the maximum pressure up to 110 psi. Due to dual-outputs, Husky 2 gal air compressor provides you the ability to work simultaneously with pneumatic tools and inflate the tires or balls at the same time. This oil-less 2 gallon compressor constructed of aluminum and steel, which ensures its high safety factor. It has two pressure gauges for checking the line pressure and air pressure in the system, which is located on top of the compressor. Due to oil-less air pump you never need to think about oil replace. That’s why its maintenance is really simple. This is a fairly quiet compressor, its noise level is about 68 dB. Husky 2 gal air compressor is good choice for home tasks. If you don’t need a lot work with compressed air and you will use it just several times a month then this little one will be the good choice for your needs. It takes about 1 minute to fill up from empty to full air tank. In addition, you can use two air tools at the same time as it has dual output connectors. Unfortunately, it hasn’t any quick connectors for quick connection of air tools, so if you want to use them you should buy additional connectors. Onboard tool and hose storage for convenience. 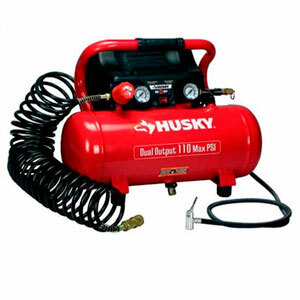 With this Husky 2 gal air compressor you can inflate your tires or paint something with your airbrush really quickly. This compressor is enough lightweight (in comparison with other models) so you can easily move it to any place at your home and garage. Overall this is a great little 2 gallon air compressor that becomes an irreplaceable assistant in your home.